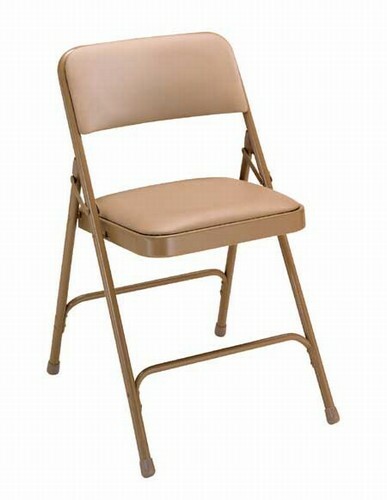 Vinyl Folding Chair from National Public Seating Corp. Fully upholstered backs - not just a cushioned pad! Full 1 1/4" Padding on the seat with heavy duty vinyl. Double Hinge on each side of chair to prevent legs from buckling. 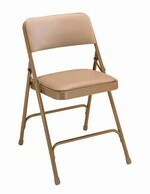 Heavy 18 gauge durable steel frame. "V" Shape Plugs on rear legs for added stability. Double Riveted "U" Brace --far stronger than any other welded straight brace. Seats are 20 Gauge steel with 1 1/4" padding covered in heavy duty vinyl, backs are 20 gauge steel with 1/2" foam and covered with vinyl. Foam meets California code flame retardant requirements. Vinyls are heavy duty, extra strong 19 mil.